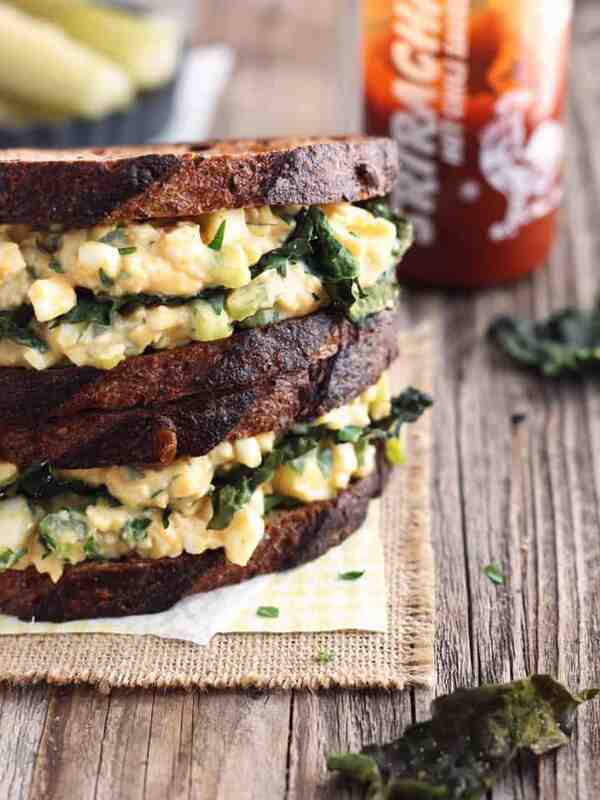 Sriracha Egg Salad Sandwich, your flavorful (not too spicy) cure for lunchtime boredom. 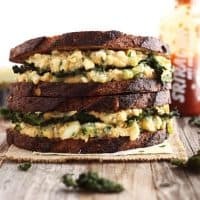 Made with Greek yogurt instead of mayo and topped with flaky kale chips this sandwich is perfect for a Saturday afternoon treat or busy mid-week lunch at the office. If you’ve got some leftover hard-boiled eggs to use up, it’s a snap to throw together! Is your office lunch awesome, amazing or more accurately described as…Meh? Feeling a wee bit jealous of your coworker’s expensive takeout. About to settle for another sad soggy sandwich…don’t do it, friend, You Deserve Better. You should be enjoying an exciting, flavorful and nutritious meal. Something that inspires Level-10 Lunch Envy. 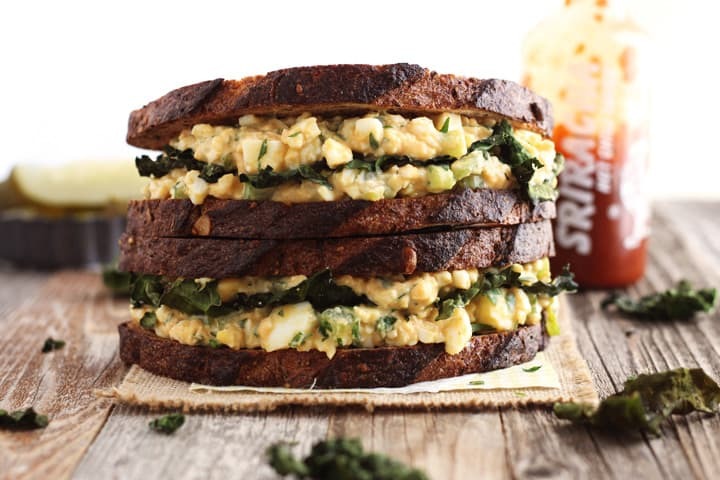 Just one look at this Sriracha Egg Salad Sandwich and your coworkers will be begging YOU for a bite. Creamy, Sriracha-spiked, lip-smacking good egg salad made with Greek yogurt instead of mayo. Flaky toaster oven kale chips sprinkled with garlic salt. Hearty whole grain bread slices toasted to perfection. Yep, this my friend is the lunch you deserve! A flavorful (not too spicy) cure for lunchtime boredom. Prepare the egg salad by using a fork to mash the eggs, yogurt and sriracha sauce together to desired chunky texture. Stir in vinegar and add more yogurt if mixture is too dry. Season with salt and pepper to taste then stir in green onion, celery and parsley. Refrigerate until ready to eat. 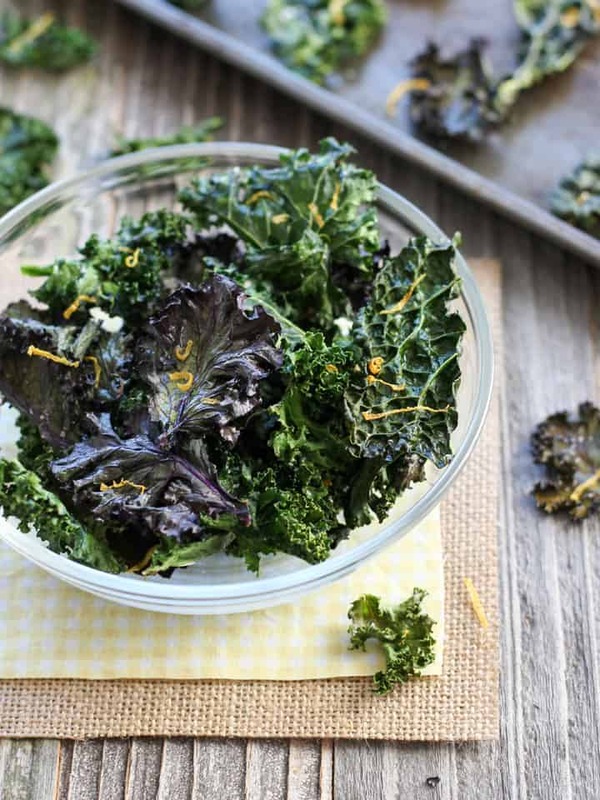 Prepare kale chips by preheating your toaster oven to 300 F. Place kale on a cookie sheet and spray with oil. Rub pieces around cookie sheet to coat the bottoms with oil. Sprinkle with garlic salt and arrange pieces so they are not touching. Bake kale for 6 minutes. Rotate pieces from back to front and bake an additional 3 to 5 minutes until crisp and dry. Allow kale chips to cool completely on the cookie sheet. To assemble sandwich toast bread slices and cool. 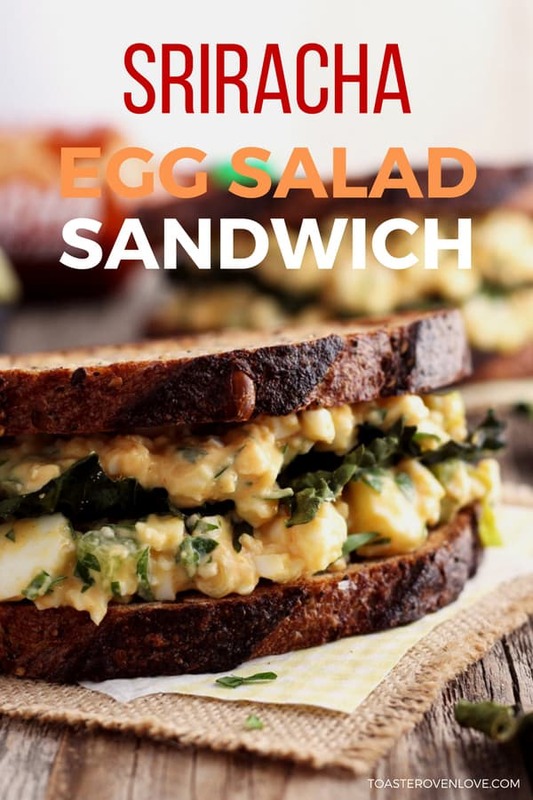 Divide egg salad into four portions and spread onto cooled toasts. Layer kale chips onto two of the toasts, top with remaining slices and serve immediately. Egg salad can be stored refrigerated for 3 to 4 days. Keep kale chips crisp by storing in a brown paper bag or sealed container with 1 tablespoon of uncooked rice. For tips on assembling sandwich at work see post. Easy to follow instructions for making hard-boiled eggs from the experts. 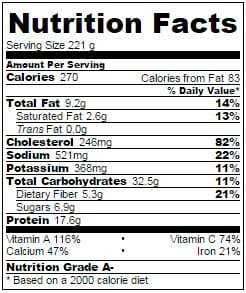 Nutritional information is an estimate for 1 Sriracha Egg Salad Sandwich. I know what your thinking, “I want this but let’s be real you can’t make it at work”…Kale chips won’t stay fresh. Egg Salad – that’s going to be a soggy mess by lunchtime. We had those same worries too. So Tim took the recipe for a “real world” test drive. The night before, we spent about 20 minutes (during commercial breaks) making the egg salad and kale chips. Uncertain of how to keep the kale chips fresh we packed them two ways. One handful in a brown paper bag. One handful in a plastic sandwich bag with uncooked rice. This satisfying Toaster Oven Broiled Eggplant Sandwich that’s packed full of delicious veggies. The broiled eggplant slices are a cinch to make and a great reason to finally use your toaster oven’s broiler. You can spread leftover eggplant slices with hummus for a tasty afternoon snack. Do you love chickpeas? One my favorite lunches are these protein-packed Spicy Chickpea Edamame Salad Pitas! An oldie but a goodie, this Roasted Red Pepper, Carrot and Hummus Sandwich will delight your taste buds (with the help of sriracha sauce) and keep your belly full all afternoon. 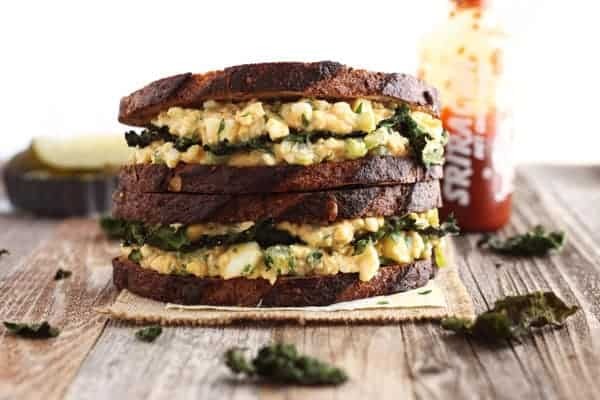 For the ultimate in sandwich inspo check out these 19 Healthy Vegetarian Sandwiches That Will Make Lunchtime Awesome. Looking For More Sriracha Recipes? Let a drizzle of Sriracha Vinaigrette spice up your next salad, take your breakfast burritos up a level with a batch of Spicy Sriracha Roasted Red Potatoes, or make dinner special with a side of Sweet And Spicy Maple Roasted Brussels Sprouts with Sriracha. can i make this with chicken instead of egg? Though we’ve never tried it, I can’t think of a reason you shouldn’t be able to swap cooked shredded or chopped chicken for the eggs. The egg yolks do add to the creaminess so you might want to stir in an extra tablespoon or two of greek yogurt to keep it from being on the dry side. Good luck with your spicy sandwich, we’d love to hear how it turns out! My egg salad sammie looks sad compared to your version! So much flavor! I need to try tomorrow! It looks amazing and not just to take to work… I’d love one right now.